South Sudanese soldiers patrol the streets of Juba. Tensions stemming from military clashes in the border area between Sudan and South Sudan appear to be de-escalating as both parties have stated their willingness to meet in the coming days in Addis Ababa, Ethiopia, to prevent a new eruption of violence, a United Nations spokesperson said today. “While the exact situation on the ground still needs to be confirmed, at the moment the situation appears to be de-escalating,” said the Secretary-General’s deputy spokesperson, Eduardo del Buey, at a press briefing at UN Headquarters, adding that senior UN officials in the area had been actively engaged on the issue over recent days. There had been growing concerns over the situation there in the wake of reports of armed clashes around the two countries’ shared border region. Yesterday, the Security Council expressed concern that a confrontation threatened reigniting conflict between the two. It called on their governments to exercise maximum restraint and to peacefully address the issues that have fuelled mistrust between them, including differences over oil, violence in the border region, citizenship and the dispute over the Abyei area. Mr. del Buey said that the both the Secretary-General’s Special Envoy for Sudan and South Sudan, Haile Menkerios, and the Secretary-General’s Special Representative in South Sudan and head of the UN peacekeeping mission there (UNMISS), Hilde Johnson, have had intensive engagement with the parties, together with the African Union High-level Implementation Panel and other international partners. 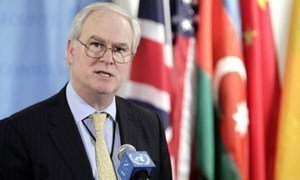 Secretary-General Ban Ki-moon expressed his deep concern about these military clashes and “urged the parties to utilize to the fullest extent existing political and security mechanisms to peacefully address their differences,” Mr. del Buey added. He also noted that Mr. Ban had urged both Heads of State to meet as planned in a summit on 3 April. There have been media reports that Sudan’s President Omar Al-Bashir has suspended his plans to attend the meeting with his South Sudanese counterpart, Salva Kiir. The Security Council voiced deep alarm today over military clashes on the border area between Sudan and South Sudan, saying the confrontation threatens to reignite conflict between the two countries, worsen the humanitarian situation there and lead to civilian casualties.